Every workshop has edge tools and Michael Forster's workshop cabinet has a sharpening station, but what is the best way to keep those all-important tools crisply sharp and ready for action? Here is a rundown of the most popular options. 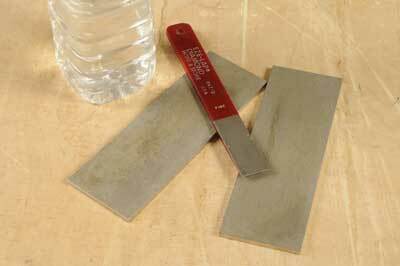 Edge tools mean all chisels, gouges and plane blades, and certain other tools such as marking knives - and they all need keeping sharp. 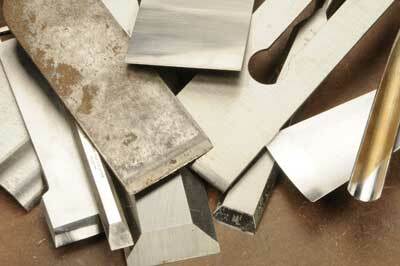 Generally speaking, the operation to create sharp cutting edges involves two stages: grinding and honing. The grinding stage can be fairly crude or more sophisticated depending on the equipment used, as it can remove a lot of metal. Honing is a finer operation to bring a finished edge, normally at a slightly steeper angle than the grinding angle. You tend to have more control when honing, as less metal is removed, and with the finer nature of a honing tool you get a keener edge. Depending on the tool and its intended use, grinding angles can vary around 25 degrees, while the honing angle tends to be slightly steeper. The smallish diameter dry grinder is, and always has been, very popular. 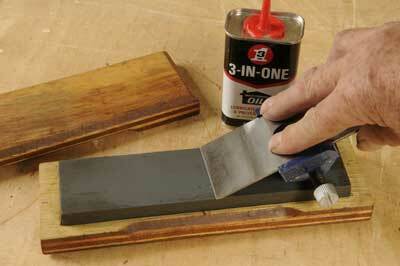 It removes metal fast, especially if you are using a coarse, rather than a fine, grinding wheel. It is well worth owning, but caution is needed as it has its drawbacks. The small wheel size creates a curved or hollow grind on the back of the blade, when ideally you need a flat bevelled surface. And the tool steel heats up very quickly especially along the edge. You can see the colour changing as friction builds up â€“ edge tools should be light straw in colour, but the heat moves rapidly to dark straw, blue, purple and then a flat blue grey colour, when it has lost its temper. Basically the steel will no longer retain a decent cutting edge. 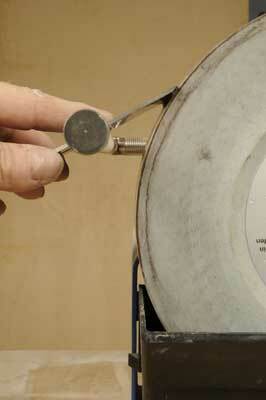 To avoid this you need to have a water bath handy and keep dipping the blade to cool it as you grind. Over the years these have become more popular, despite their cost. They are not as fast as a dry grinder but quick enough, and the tool edges do not get overheated as they are constantly cooled by the much larger water slicked abrasive wheel, which also largely eliminates the problem of an excessive hollow grind. They often have a second honing wheel, so the whole operation can be achieved pretty much with one machine. 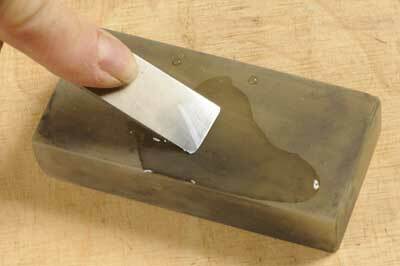 Oilstones have been used for an eternity for putting an edge on tools. Often they have a coarse face bonded to a fine face. 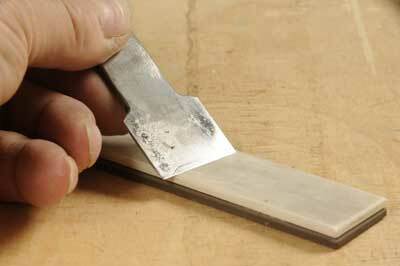 However, they clog with the cutting oil and fine metal swarf from the blade. Eventually they develop a dip in the middle from repeated use. They are handy to keep in a site tool kit, but too crude for good quality workmanship. More recently, diamond sharpening plates have been available, dusted evenly with industrial quality, ultra fine grade, diamond coating. They are now so cheap they turn up at street markets and tool fairs as well as tool dealers. Some are better than others - the solid plate type at least has a continuous covering of diamond. Water is the lubricant or use a special diamond lubricant, or dry for a coarser result. Several grades are needed so you can end up with the finest edge possible. They give a rather 'raw' sharp edge, not favoured by aficionados. However, they do work and the plates cannot hollow as the usual oil stone can. Typically these are either three different grades of Arkansas stone, or Japanese stone, that come in a range of particle sizes - many of them extremely fine grades indeed. Once you have used and appreciated just how sharp and polished a result these can give, other types can seem crude by comparison. Another modern development, ceramic, offers very fine sharpening qualities for a really keen edge. 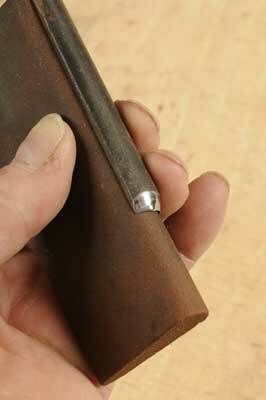 Curved tools, like gouges, need slip stones or cones which have radii similar to the curve you are honing. 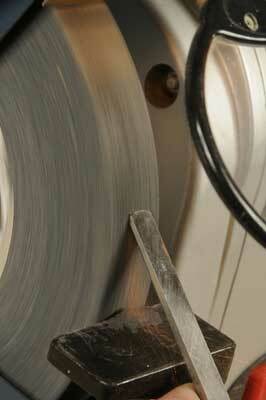 There are variants made from different abrasives - from oilstone to diamond coated. The ideal combination would be a dry grinder, wet grinder, a couple of diamond plates and a fine whetstone. However, cost is factor, so buy as you can afford and appreciate the benefits each type brings.